Here's a different question: what line would they fall under? It's pretty much a safe assumption that the current line is just "Transformers (2014)" now, with "Age of Extinction" as one sub-header, with the Legion repaints falling under an unspecified one. Likely another "archive oops" like Generations Jhiaxus, Hero Mashers Heatwave, and more. JelZe GoldRabbit wrote: Here's a different question: what line would they fall under? It's pretty much a safe assumption that the current line is just "Transformers (2014)" now, with "Age of Extinction" as one sub-header, with the Legion repaints falling under an unspecified one. Looks like these could be them. Asian Children's Day, huh? *looks it up* In Japan that was May 5th, China is June 1st, and Singapore is October 1st. Sheesh, stick to one day you guys! That Blazemaster mold is a crappy mold. Too bad they didn't choose a better heli mold. On the plus side, Streetsmart looks pretty cool! I'd buy it as a standalone figure if that were an option. Is it just me or is anyone else upset that these will pretty obviously not actually be a combiner? The Protectobots are back again. GREAT! Now if they were just combiners, I'll spend money on them. Also I think that Groove is female, due to the fact that it's made from the Prime Arcee mold, and it has feminine features. Groove looks exactly Arcee with some extra silver bits, First Aid is just Ratchet with more blue, and Streetsmart appears to be Prowl, but with Smokescreen's deco. 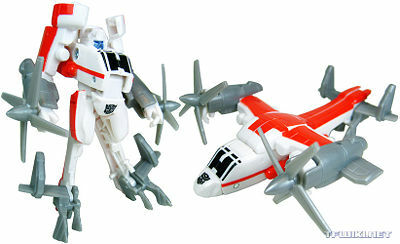 The sad part is that this is likely the closest we'll get to having Classics Protectobots. 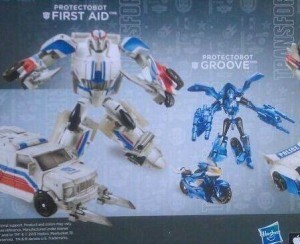 Groove looks exactly Arcee with some extra silver bits, First Aid is just Ratchet with more blue, and Streetsmart appears to be Prowl, but with Smokescreen's deco. They didn't even change the base plastic colors. Loving the look of these guys! I don't own any of these molds (except for ratchet, but I love it so I cant be too disappointed)and having all these guys together as a Protectobot team (the team nobody really likes) will look great. Also points to Hasbro for a realistic sized motorbike,at last!No idea what these guys will come under, knowing Hasbro recently it'll end up being Age of Extinction! Metro Prime wrote: Groove looks exactly Arcee with some extra silver bits, First Aid is just Ratchet with more blue, and Streetsmart appears to be Prowl, but with Smokescreen's deco. They didn't even change the base plastic colors. GDO Series Hot Spot and Universe 2008 Blades. So the second set would be obsolete. Metro Prime wrote: The sad part is that this is likely the closest we'll get to having Classics Protectobots. I mean, it's cool that the whole team got released, but apart from the Protectobot label there really just isn't any appeal to these. I mean, it's cool that the entire team got released, but apart from the Protectobot label there really just isn't any appeal to these. On the downside, these are kind of "meh" redecos. How cool would G2 colors have been? On the upside, the Prime Ratchet and Prowl and RTS Grapple molds are really nice molds. Wow. This definitely ranks up there with some of the most shameless repaints ever conceived. I don't think even the geewun crowd would shoehorn these abominations into their classics collections. I think the only combiners that I'll ever truly enjoy are the original ones from RID so the lack of classic combiners these days doesn't bother me. It's sad however that these figures are being used as those decos are so close to Ratchet and Smokescreen's. On the other hand though, I would get that set with the Blazemaster and Grapple repaints. I very much like both of those figures. I like them. It would be nice to have back up for my GDO Hot Spot, provided I can afford the money and space. Too bad I didn't get the Blades repaint of Evac, but Evac himself will probably look pretty good with them, and give me an excuse to return him to the front lines, as it were. The 3-Pack set is promising. First Aid and Streetwise aren't too far off in terms of color from their G1 selves, and they match quite well in terms of a "Team Color Scheme." Groove is a mess. They could have used Legends Animated Prowl for a better robot mode and alt-mode match. The Hotspot and Blades pack is...meh. The good news is, we already have Protectobot Hotspot from Generations GDO, a proper coloration of the same mold (with a more appropriate accessory), and several options for Blades, including the Universe 2008 repaint of Cybertron Evac, the ROTF Evac (redeco of Blazemaster), which is a better color match for the same mold they are using for the 2-Pack, or even Universe Legends Blades (if scale is not a concern). My plan is to skip the 2-Pack, keep using GDO Hotspot and Universe 2008 Blades, pick up the 3-Pack for First Aid and Streetwise, and replace Groove with Legends Animated Prowl. Wolfman Jake wrote: The 3-Pack set is promising. First Aid and Streetwise aren't too far off in terms of color from their G1 selves, and they match quite well in terms of a "Team Color Scheme." Groove is a mess. They could have used Legends Animated Prowl for a better robot mode and alt-mode match. The Hotspot and Blades pack is...meh. The good news is, we already have Protectobot Hotspot from Generations GDO, a proper coloration of the same mold (with a more appropriate accessory), and several options for Blades, including the Universe 2008 repaint of Cybertron Evac, the ROTF Evac (redeco of Blazemaster), which is a better color match for the same mold they are using for the 2-Pack, or even Universe Legends Blades (if scale is not a concern). My plan is to skip the 2-Pack, keep using GDO Hotspot and Universe 2008 Blades, pick up the 3-Pack for First Aid and Streetwise, and replace Groove with Legends Animated Prowl. Yeah, and every time you look at "First Aid" and "Streetwise" you know they are really just repainted Ratchet and Prowl figures from a toyline different than classics. 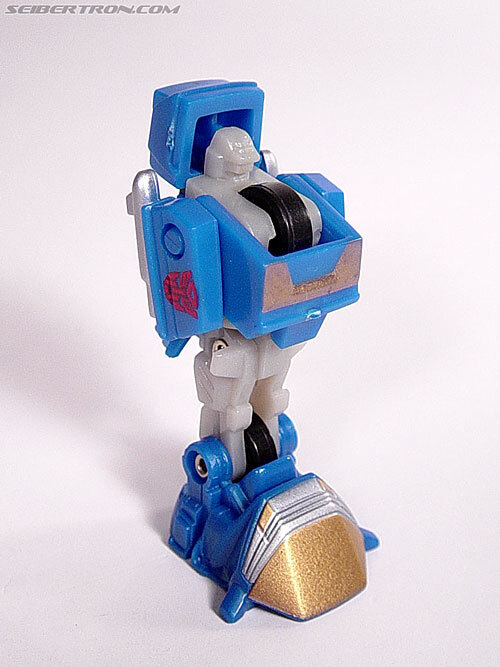 The Prime designs do not pass as classics. Look at the face sculpts and tell me that you can convince yourself they are the G1 bots they claim they are. That is like trying to look at Animated Arcee and telling yourself it is classics. You are only kidding yourself. You might as well just pick up Prime Ratchet and Prowl and use them as stand ins to skip the inflated pricing because that is what they are.